I do love my craft supplies. And I really love my washi tape. So when the folks at the awesome new site Downtown Tape contacted me I was pretty excited. And at less than $2 a roll. Score. I'm already thinking about Christmas gifts and decorations. Just right for dressing up homemade goodies, gifts, envelopes, that kind of thing...right?? And you can take a peek around the Downtown Tape facebook page for some of their inspiration, too. Now for your chance to win 10 rolls of washi tape (yay!! ), leave a comment with an idea of what you'd like to use it for. Giveaway open until Saturday at midnight. Winner can be anywhere, worldwide. I would love to use it as a project for my baby girls room...she's coming in march and I'm ready to decorate!! Adorable! I would use it to make ornaments or handmade cards! I'd use it to add a little pizzazz to presents/ornaments. I would love to use it in my girls room to hang pics on the wall. I would LOVE to make a holiday "banner" for my fireplace. Have seen this tape but do not own any! So excited about this giveaway. I've seen washi tape everywhere and have yet to pick some up for myself. I think once it was in hand, the possibilities would be endless... washi tape would be everywhere! Who says you can't have a washi taped wall? OR I'd cover an ugly white lamp shade with strips. I'd use it in the kitchen, to dress up bagged lunches and label my freezer foods and leftovers. And of course I'd use it on plain notebooks and notecards. Thanks for the giveaway! I cannot believe I do not own any yet! I would use some for christmas and decorating the nursery of my soon to be born baby!! I think I'd use it to decorate for my husband's 40th birthday party! So fun! I would use Washi tape to decorate an accent wall in my bedroom! What wouldn't I use it for?!? I adore washi tape, and use it for everything from gift wrap to taping patterns together to sticking school reminders on the cabinet to making cake banners... I could go on & on. Thanks for the chance! I like striped washi tape and I'd love to use some for gift wrapping this Christmas! 10 rolls?!?! That's awesome!!! ohhh...i would use it to tie up cake pops in cellophane bags for the school bake sale! thank you!!! I'd use it when gift wrapping! I'd use it for cards and gift wrapping. Great giveaway! I would love to use washi for ALL THE THINGS!! I've seen so many cute things to do with Washi tape and I want to try way too many to name! You had me at gingham! 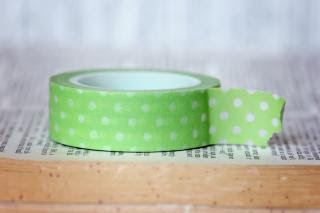 I would love to make cookies for friends and put them in little bags with this tape...it would be the perfect touch! I have a stainless fridge that is not magnetic, so I like to use it to put pictures and drawings on the fridge! I also love the little banner you made. I think I'd use it for Christmas cards, gift wrap, and various crafts! 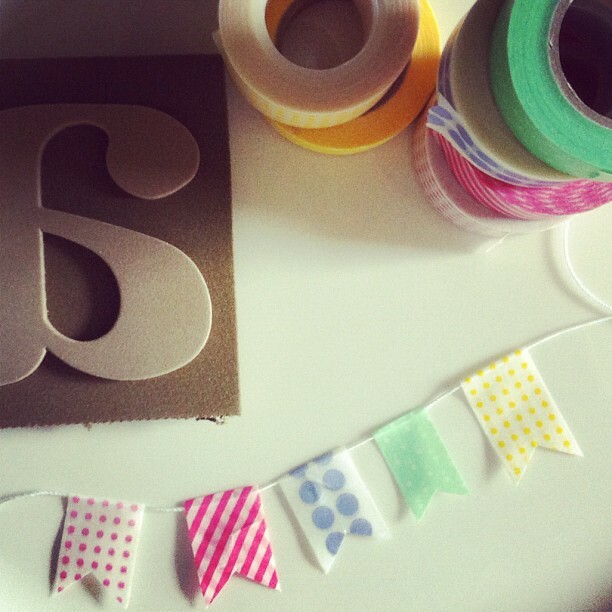 I'd love to use some washi tape to make banners for the next birthday party in our house. Wrapping Christmas gifts for teachers! Little gift card envelopes! How fun! I've never played with it before but I really like the idea of jazzin' up presents with it! Thk you for the giveaway! sealing Christmas cards for sure! Thanks for the giveaway! How fun! I'm planning to use some for our christmas cards and for packaging holiday goodies for neighbors & teachers. I would use it to make my packages this year that much better! This tape has reinvented the way I wrap!! I would give these as stocking stuffers to my daughter. She loves washi tape, and has it on her Christmas list for making all kinds for crafts! I would use it to gift wrap and to "dress up" tin cans. I'd love to wrap gifts with the tape! I would love some washi tape for Christmas wrapping this year! I love the idea of sealing Christmas cards-I'd never lick another envelope again! Attaching photos of the recipients to the wrapped gifts! I love washi tape! I would love to make some washi tape Christmas ornaments! They would look so pretty! Yea Downtown Tape! I will use it to decorate napkin rings and individual place setting decor! oh wow!! ive never used washi tape before...id love to try it out with some christmas ornaments or gifts, a fun banner, maybe something for my sons room?? the possibilities are endless!!! Perfect timing to use it for Christmas! I would use it to make a cake banner and holiday cards. Great giveaway! I would love these tapes and use them on my stationary, in wrapping, and on place cards! Wouldn't they be the perfect accent to my Thanksgiving table?! I was trying to think of a way to use them for cards, great idea you have! I'd pretty up Christmas presents. I haven't tried any washi tape before. I saw some cute cards on Pinterest, and would love to make some! 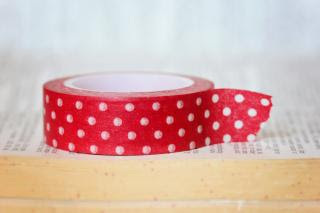 Polka dot washi tape - love it! I would brighten up the very plain planner I have for 2013, make a mini banner for my daughter's doll house and seal gifts and cards. What fun! I would love to use it when I am sending out pretties from my shop...what a beautiful touch it would add! I have been wanting this tape I would love to use it in the Art Journals I am going to do in the new year. I would buy some lovely paper (white or brown) and use the tape for Christmas wrapping to fancy it up but keep it simple (does that make sense?). i have wanted to try to make some cute cards with little washi tape bunting on them - i think this would fit the bill! 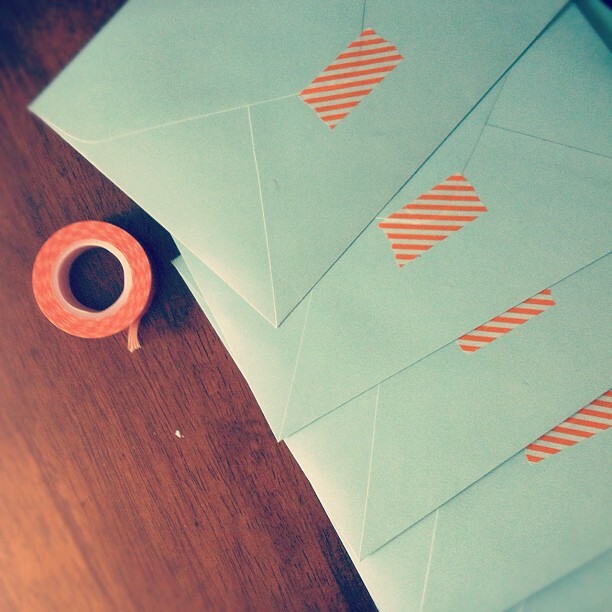 I love using washi tape on holiday cards & envelopes! Downtown Tapes are great quality! I love them! Terrific giveaway! I would love to use it for making pretty christmas presents. Some kraft paper and a pretty washi tape like this would look beautiful! I would love to use it to decorate my laptop cover! Mine is pretty plain now and could use a little fun!!! We'd love to use it on our Christmas cards! I'd use it in place of magnets to hang things on our fridge. Much cuter and perfect for soon to arrive Christmas cards! I would use it on our Christmas cards and in my scrapbook. Love it! I would use them for sealing special packages and presents! My goodness, I would go crazy with my ATCs if I had 10 rolls of washi tape! Thanks for the great giveaway! I would use this for gift packaging for sure! I've resisted washi tape until now, I bought my first four rolls last night! Wish I'd known about this site 24 hours ago :) thanks! Love these! What a fun giveaway! Any and everything. Love, love, love! Wow 10 rolls of washi tape - I would definitely be able to put it on everything! I may have a problem knowing when to stop :) Thanks for the chance at such a great giveaway. I just want some because everyone else has some! (just kidding, kind of...) I would love to try some. Wrapping presents is coming, and this would be so cute with plain craft paper. i would use it to close up my christmas cards. so cute! What a fun giveaway! I'd use it to decorate plain notecards! I would use it to decorate the wrapping on gifts and make cards! Great giveaway - Christmas comes sooner :) I would use them to create holiday cards. oh, little washi buntings. and wrapping brown paper presents! and notes... oh it never ends! Gift wrap, gift tags and, anything else I can find to stick it on!